Editions is a way to configure two or more versions of an application. For example, let's say you add a cool new feature to an application and you want beta users to try out the new feature and provide feedback. Editions would be a great way to support this type of need. 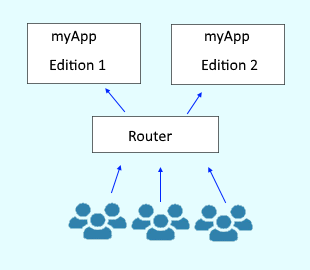 For example, you could create edition 1 (non-beta) and edition 2 (beta) of the application, and then setup routing rules to route non-beta users to edition 1 and beta users to edition 2. 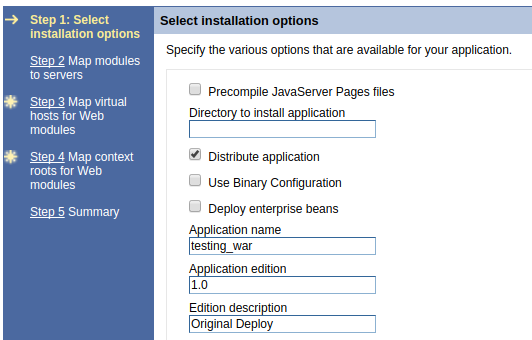 When manually deploying an application using the WebSphere web console, at Step 1, you can specify a unique application edition. In this example, "1.0" and "Original Deploy" are specified as the application edition. When you specify an edition, the edition will be displayed in the applications page. In this example, since we gave testing_war an edition, "1.0" is displayed. "Base edition" will be displayed if an edition is not specified during the deployment of the application. When deploying a new version of the application, a higher edition can be specified, such as "2.0'. In this example, there are two versions of the Delta application, Base Edition and 2.0, and 2.0 is inactive. An edition must be activated before it can be started. Following are the common next steps.